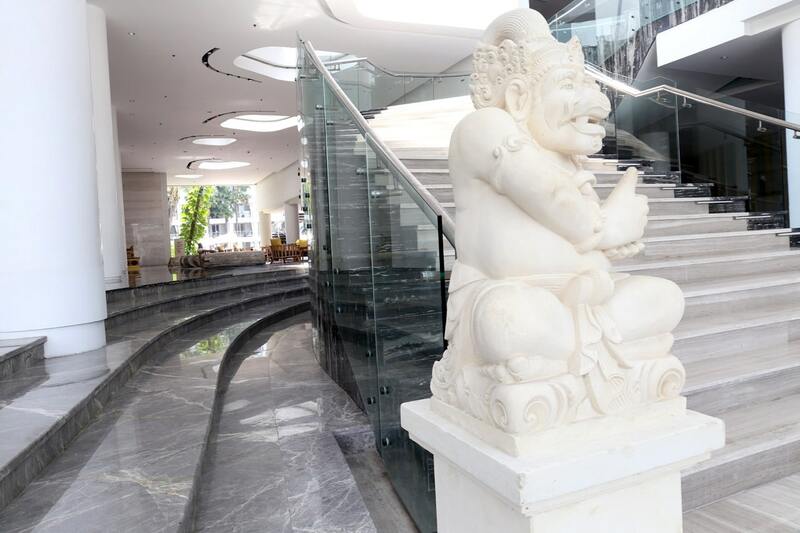 Boasting exquisite design, luxurious accommodations and world-class amenities, The Stones a Marriott Autograph Collection Hotel in Bali delivers a truly unforgettable experience. 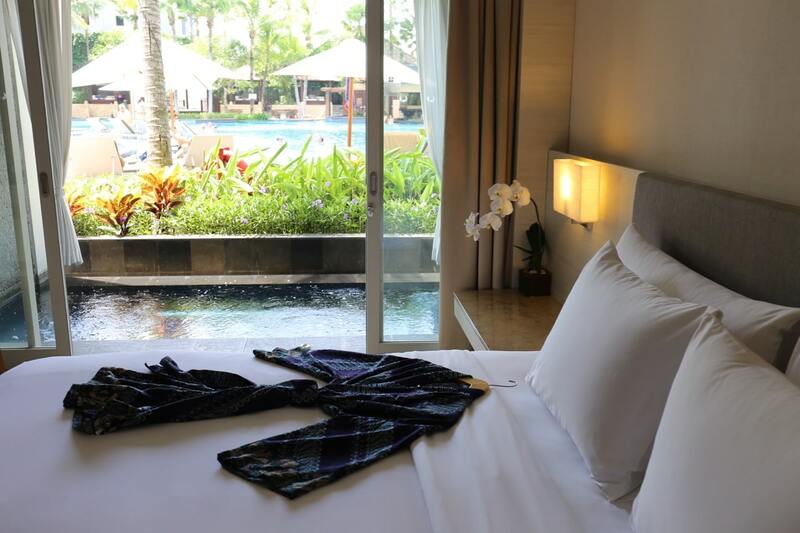 The posh property is conveniently located at the southern tip of Legian Beach, a short stroll to the vibrant activity of surfer-loving Kuta. This would be my first time experiencing a property in Marriott’s Autograph Collection. Marriott hand picks flashy boutique hotels, each one chosen for its founder’s vision, the thoughtfulness of its design, its inherent craft, and its connection with the locale. Beyond Bali, the Autograph Collection features jaw-dropping boutique hotels from Atlanta to Azerbaijan and Bogota to Baden-Baden. At The Stones, iconic architectural design meets eclectic sophistication, offering guests a haven of elegance and style. 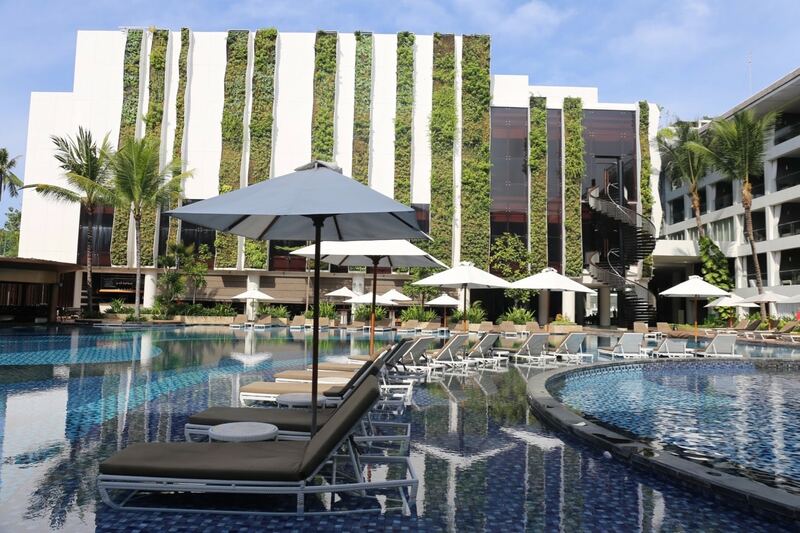 The resorts jaw-dropping design feature is a dazzling vertical garden where verdant Walisongo, Talas and Pakis plants bath in Bali’s warm sunshine. The hotel’s iconic garden sits perched over a lagoon-style pool and on hot afternoons it’s here where you’ll find guests relaxing in private cabanas or sun tanning on lounge chairs which sit in cool, shallow water. The Stones Hotel’s luxuriously appointed 308 guest rooms and 22 suites are sleekly designed for the stylish traveller. Guest room appointments include comfortable bedding, rainforest showers, in-room espresso machines, 42” LED screens and Bose iPod docking stations. 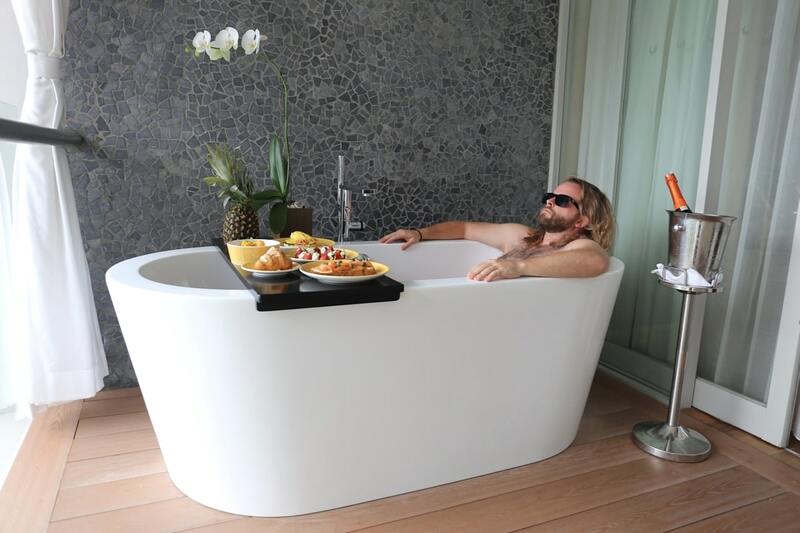 If you’re looking to #treatyoself and can’t be bothered to skip down to the hotel’s brunch buffet simply ring room service and order the hotel’s signature Breakfast in the Tub. My suite on the hotel’s 5th floor featured a spacious soak tub on the balcony featuring jaw-dropping views. Friendly staff will straddle a brunch spread across your tub featuring cheese croissant, eggs benedict, smoked salmon and cream cheese bagel, mango and granola topped yogurt and strawberries with cream. A bottle of chilled sparkling wine resting in an ice bucket is the best way to wake up to the world! If you’re looking to enjoy a moment of rest and relaxation pay a visit to the hotel’s Celestine Spa. 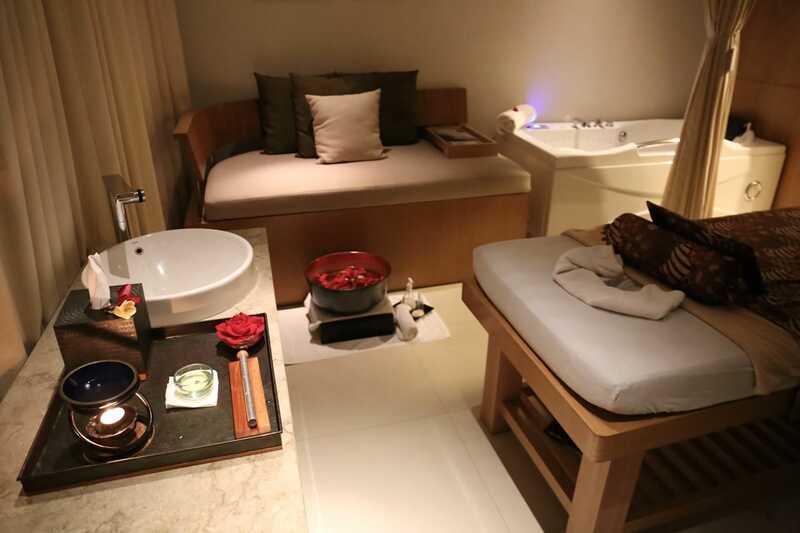 Located on the main floor, Celestine Spa offers soothing treatments featuring traditional Balinese massage therapy, facials and body wraps that are sure to lick that bout of jet lag. Talented therapists will rejuvenate your body using beauty products by Bali Passion and Pevonia Botanica. If you find yourself keen for a cocktail, swim up to the pool bar and sip through a thirst quenching duo: lychee, peach and strawberry muddled Tropical Mojito and classic Mai Tai which is served in a frozen pineapple. 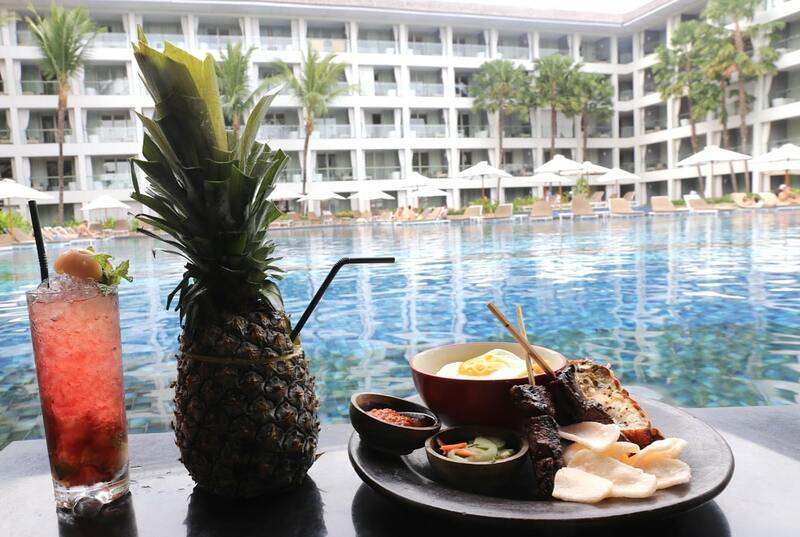 When peckish at the pool be sure to feast on the kitchen’s signature Nasi Goreng, a souped up shrimp fried rice accompanied by grilled lobster, wagyu beef skewers, fried egg and spicy sambal. For a truly authentic Indonesian dining experience enjoy a leisurely evening at the hotel’s signature restaurant, The Long Rice Table. 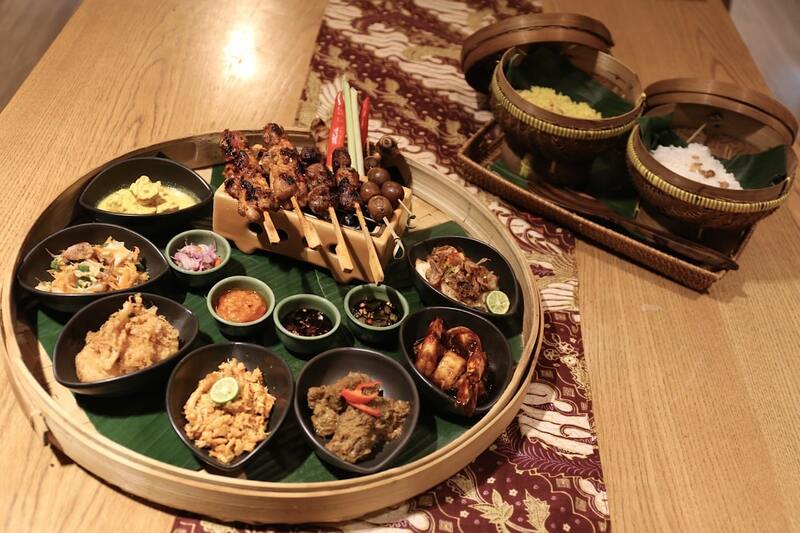 The menu here specializes in Rijsttafel, literally meaning “rice table,” which originated with the Dutch plantation owners, who liked to sample selectively from Indonesian cuisine. Steamed white and yellow rice is always the centrepiece and accompanied by a range of different meat, poultry, seafood and vegetable dishes. These boiled, grilled, roasted, steamed, wok-fried or deep-fried dishes are complemented by krupuk (rice crackers), acar (pickled sour vegetables) and a range of chili and onion sambals.